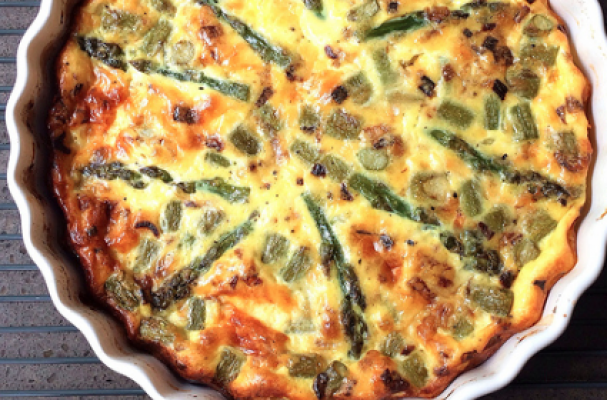 Crustless asparagus and ramp quiche is an elegant spring dish that can be served at almost any event. Ramps are one of spring's delicacies because they have such a short season. These wild leeks have a mild onion flavor with a hint of garlic. Since they are foraged, they can be hard to come by. You will have the best luck finding these beauties at a local farmer's market or specialty market like Whole Foods. If you cannot find them, substitute with leeks. Enjoy this delicious quiche for breakfast, lunch, or even dinner. Step 2: Generously butter a 9 inch pie plate and set aside. Step 3: Toss the ramps and asparagus spears with olive oil, salt and pepper and roast for approximately 8 minutes. Remove from the oven and let cool slightly while preparing the other ingredients. Reduce oven temperature to 350 degrees Fahrenheit. Step 4: In a mixing bowl, whip the eggs, whole milk, and half and half. Season with salt and pepper. Stir in the cheese and parsley. Roughly chop the asparagus and ramps and add it to the egg mixture. Step 4: Pour the custard into the prepared pie plate. Lightly tap the pie plate on the countertop to remove any air bubbles. Bake the quiche for 40 to 45 minutes until the eggs look set and the edges are slightly browned.